Cpl. Johnny W. Sanderson, son of Mr. and Mrs. R. B. Sanderson, attended Cons. No. 1 School. 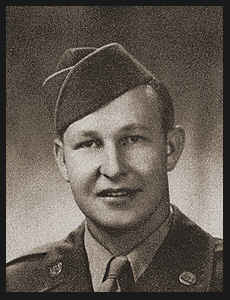 Entered Army in Dec., 1942, trained in Ft. Belvoir, Va.; served in N. Africa, Sicily, Italy, France, Germany, Austria, England. Awarded Bronze Star, Good Conduct Medal.